Apple Valley Lake - 1009 Apple Valley Dr | LAKE VIEW! Apple Valley Lake - 3381 Apple Valley Dr - BIG ranch home!! Apple Valley Lake - 633 Baldwin Hgts Cir | Pool house! Apple Valley Lake - 846 Fairway Drive | Golf Course Front , Schlabach Built! Apple Valley Lake - 930 Fairway Dr - Golf Course Front! 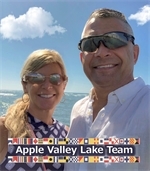 Apple Valley Lake - Vacant lot within 1 block of Davis Beach! Apple Valley Lake | 9 Grand Ridge Ct | Double Lot, A Frame! Counting down until Spring at Apple Valley Lake! Looking for LAKEFRONT property at Apple Valley Lake? Mavic 2 Pro - Hyperlapse for the first time over Apple Valley Lake ?? RE/MAX Consultant Group, Toth and Team, not your average agents!